It felt like a mountain of supply sitting on stocks last week, growing more ponderous by the day. By Thursday the broad averages were too fatigued to achieve even minor ‘Hidden Pivot’ rally targets, the still-feisty FAANGs too subdued to help. Of course, just because the market looked punk on a given day does not preclude the possibility that, come the next, traders will conveniently forget what was troubling them. Unfortunately for bulls, however, pulling off this ‘weekend alchemy’ has grown increasingly difficult because of the darkening economic picture. It’s not just little stuff, either — i.e., the kind of problems that will lift in time to allow Q2 earnings expand. Take Ford Motor Company, for one. The automaker is having such a rough time in Europe that they’ve begun closing plants, cutting thousands of jobs and eliminating low-profit car models. A second, worrisome story played prominently in Friday’s Wall Street Journal reported Apple’s slowing sales in web-based services. This matters a great deal because it is a multi-trillion dollar business. AMZN is by far the dominant player, but even the also-rans — big companies like Microsoft, Google and IBM — have been counting on robust growth in the cloud to bolster revenues as margins on physical products continue to decline. Apple was hurting to begin with because of disappointing iPhone sales in China. But falling demand for internet services could conceivably be the blow that pushes the Cupertino firm’s stock below $100. Such a fate was all but unthinkable when shares of Apple were hitting records above $230 in October, but it is very thinkable now. If we assume that every uptick in shares is being used by the Masters of the Universe to distribute them, a day of reckoning is not far off. Until then DaBoyz — i.e., those who live very comfortably by manipulating the stock market — can be counted on to milk every last bid until buyers are spent; and then, inevitably, to pull the plug. I fleshed this out technically a while back with a chart showing VXX, a trading vehicle that tracks short-term S&P 500 volatility. The updated chart (click on inset) shows not only that the 56.30 rally target remains unfulfilled, but that the distance to the target has increased recently due to the lazy, distributive ascent of stocks. VXX tends to rise when shares are falling. For it to rise to 56.30 from a current 39.31 would take a plunge in the S&Ps of perhaps 300 points — equivalent to an approximately 3000-point drop in the Dow. Given the strong rally early in 2018 that formed the rally pattern’s left side, I’d say the odds of this are at least 40%. The alternative would be for VXX to detumesce down to long-term support near 25. If that is what’s coming, get ready for an asphyxiatingly boring 2019. It is even worse than you think. Much, much worse. The vast majority of the “book value” of the lunatic stocks you mentioned (AMZN, FB, AAPL) is nothing more than Goodwill, or more precisely, the amounts they’ve overpaid for insanely expensive acquisitions during the latest bubble. Adding in the effect of massive stock buybacks at inflated prices, these companies in fact have “real world” book values that are close to ZERO or even negative. VIX is a 30 day Volatility Index. 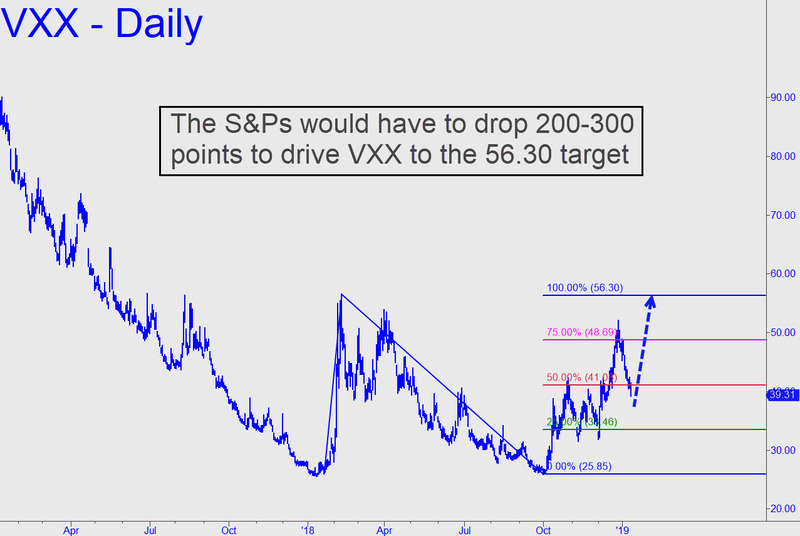 The point of VIX is to show where options are pricing in a SPX 30 day move. Using VIX you can calculate the odds that SPX will be at any point. This red line is where SPX only has about a 17% chance of being above, normal distance between SPX and VIX. This is SPX with a +1 Standard Deviation line (SD) to show where options priced an -83% chance of being-under on that date based on VIX. SPX is getting dangerously close to the +1SD line in the next week or two, where option sellers (writers) lose everything because they are naked the market. Last time this took place was 02012018 Volatility Crash. NG SPX Update shows where the market is in line towards the analog of the NG Volatility surge recently, where ‘writers’ went bust. Doing a quick look on the internet, I see AAPL with a book value of about $23 a share. I see F with a book value per share of about $9. AMZN is at a book value per share of about $81. The closing price for F was $8.82 on Friday. Ford makes cars and trucks. AAPL sells conspicuous consumption computers and phones. Amazon has a government sanctioned monopoly as an online flea market.